The life of a freelancer is often desired by designers who work as employees. The usual assumption is that a freelancer designer has the freedom to sleep in and take time off whenever they need or want to. In reality, we all know that freelancers have to work hard in order to be successful, but things tend to look a little bit better from the outside. If you’re thinking about leaving full time employment to go out on your own as a freelancer or to start your own design studio there are a number of things that you should consider before making a decision. From my own experience, leaving full-time employment was probably the best decision I ever made for my career, so I would certainly not discourage others from going out on their own. But I do think it is important that an informed decision is made rather than a rash decision. In this article we’ll take a detailed look at the things you should consider before entering the world of self-employment, and then we’ll also cover some tips for finding your first clients. Keep in mind that everyone’s situation is unique. If you’re currently unemployed and unable to find full-time employment, your situation will be much different than someone who currently has a comfortable salary as an in-house designer somewhere. Both may be interested in self-employment, but the two different situations will influence the decision in opposite ways. As you’re reading through the information here you, of course, will want to keep your own situation in the forefront of your mind to serve as a context. Be sure to check out our Freelance Starter Kit. It’s got all kinds of valuable resources that can save you time and make your freelancing efforts more successful. You’ll get things like contract templates, identity set templates, e-books, interviews with successful designers, and more. Don’t just walk into your boss’s office and turn in a letter of resignation without first considering what life will really be like as a self-employed freelancer. In today’s marketplace there are thousands of designers and developers out there competing for work. Sure, there are also plenty of potential clients out there, but you’ll need to be able to show some of those potential clients that you have what it takes to be the right designer for their project. As a freelancer not only will you be competing with other freelancers, but you’ll also be competing with design agencies of all sizes. In addition, the growth of do-it-yourself web design options like Wix and others are also competition for freelancers who are targeting small business. They may not offer the same personalized and customized services that you can offer, but many clients are choosing to go this route for small projects rather than hiring a designer. The competition certainly doesn’t mean that you can’t or won’t succeed. There are plenty of opportunities to find work as a freelancer, just know that it doesn’t come easy for most who are making the jump. Be prepared to have to work hard. If your work experience consists only of working as an employee, chances are you have always had a salary and a consistent paycheck. Life is much different as a freelancer because regardless of how successful you are, your income will never be totally consistent or predictable. Your income can fluctuate based on how busy you are, when your milestones and payment dates happen to fall on client projects, and even things like slow paying clients will have an impact. Depending on your outlook this could be good or bad. Sure, there is a chance that you won’t make as much money as you would as an employee, but there is also the chance that you can make a lot more. Personally, this is one of the things I like about being self-employed. Success will mean that you are personally rewarded, not just that your boss or employer is rewarded. Life without a consistent paycheck is something that can be a difficult adjustment. Some people are ok with it and others really can’t function this way. Most likely you already know if this is something that would make you really uncomfortable, but be sure that you try to imagine what it will be like before making the jump. If you don’t mind having some inconsistency in your pay you will probably find that it actually gives you a lot more motivation and that you enjoy your work more than you would as an employee with a set salary. Don’t expect to start your work as a freelancer and to achieve success immediately. Unless you already have a very strong network or strong name recognition, it will take some time to build up your client base. You’ll need to account for this and have some money saved up to support yourself for at least a few months in case you’re not able to bring in very much with your freelance work. The amount of time it will take to build up your business and your client base will vary and will depend on a lot of different factors, so just be prepared to have some patience. It’s not uncommon for a designer to want to go freelance because he or she has all of the required design skills, and why not work for yourself instead of working for someone else? The truth is that being successful as a freelancer will depend on much more than just your design skills. Sure, being a talented designer is a part of it and you’ll need those skills to do a great job for your clients, but there are also a lot of other things you will need to be able to do as a freelancer. As an employed designer your job is primarily just to do the actual design work. You probably have no responsibility to find potential clients, to draft proposals, to price the projects, to secure the sale, to handle the finances of the business, to deal with taxes, etc. As a freelancer you will need to be able to deal will all of these things. You don’t have to be great at all of these things, but you do have to be willing to do them and to work at improving in your weaker areas. This one can be a big adjustment for many new freelancers. It’s something that’s kind of obvious, but a lot of people don’t really think about it or understand the full consequences. As an employee you have some paid vacation days, maybe some sick days and personal days as well. You’re also probably paid for holidays when you don’t have to work. When you add it all up, this actually accounts for a pretty significant amount of time each year. As a freelancer you won’t have an employer to pay you for your time off. If all of your income is from client projects you won’t be making any money when you’re not working. That doesn’t mean that you shouldn’t take time off, we all need a break, but it does mean that you’ll need to account for it and plan ahead. Vacations can be a little more stressful as a freelancer. Knowing that you’re not working and producing any income can be discouraging if you let it distract you from enjoying your time off, but you’ll also need to have a plan for providing customer service while your away. Some of your clients may want to reach you while you’re on vacation, so you’ll need to decide how you want to handle this. Even if you let the clients know that you’ll be away from work there is a chance that some emergency could arise. Also, vacations and time off can be a challenge when you’re right in the middle of a project or when a deadline is approaching. All of these things are just challenges that you will face as a freelancer or independent designer. They’re certainly not challenges that you can’t overcome, but it’s important to realize that taking time off from work will not be quite as easy as simply putting in a request to your boss. One of the things that is a major challenge for some people who are self employed is that there is no boss or employer to hold you accountable. No one is going to tell you what time you should start work in the morning, how long you can take for lunch, what time you can end work, or when you can take off. Depending on your personality this may or may not be an issue. Personally, I’ve never had trouble with it because if I’m not disciplined I know it will hurt my income, so being motivated is easy. But this isn’t the case for everyone. Think about what it would be like for you if you had no one to hold you accountable before making the jump. If you think you would have a hard time getting and staying focused you may have a difficult adjustment to the life of a freelancer. I mentioned earlier that achieving success as a freelance will require you to be able to do a lot of things aside from just designing. In reality, you’ll be responsible for every aspect of the business. You won’t be able to rely on your boss or a sales department to hand new clients over to you. If you’re having trouble with coding you won’t be able to walk across the office to a more experienced developer for some help. Working on your own can be a great thing, but there will be times when you’ll wish there was someone else who could take care of some headache that you just don’t want to deal with. The actual designing part of your job will take up a smaller percentage of your time because you’ll also need to do so many other things. Many designers find that they prefer working as an employee better because they can spend almost all of their time designing rather than dealing with all other aspects of the business. This can actually be a good thing though, because you’ll get to do a lot of different things so you won’t get bored doing the same thing all the time. Also, you get the chance to do things that you would never get the chance to do as an employee. When designers who are considering life as a freelancer stop to think about how much money that could make if they were on their own, they often underestimate or completely ignore business expenses. You may look at the amount that a client is paying for a particular project and think that it would be great if you could make that much by doing the job as a freelancer, but don’t forget that you’ll have expenses that will reduce the profit from the project. Expenses are just a part of doing business and they are not always bad, but you’ll need to think in terms of profit instead of just revenue. One of the things that makes it so easy for people to enter the world of freelance design is that the startup and ongoing costs are manageable, but they still need to be considered. Most freelancers work from home, but you may need to get some furniture for your home office. You’ll also need things like a computer, printer, phone, and tablet. You’ll have to pay for software and you may use web apps for things like invoicing and project management. Add things like business insurance and an accountant’s services, and it all adds up. Most likely you already have some of these things even if you’re not working as a freelancer, so it’s probably reasonable, you just need to take it into consideration. Going along with the previous point on business expenses, you’ll also have to provide your own health insurance as a freelancer. As an employee you probably can get insurance through your employer, and getting it on your own is usually more expensive. If you have a family this becomes an even bigger expense and definitely a more important issue. Be sure that you look into it and get some estimates so you know at least approximately what you should expect to spend on health insurance. One of the best things about being independent is that you’re in charge and you get to make the decisions! You’ll get to work with the clients of your choice, not the ones that your employer assigns to you. You’ll get to decide what type of projects you want to specialize in and what types of clients you want to target. You’ll get to decide how much you want to charge for your services (of course, you’ll need to charge a rate that is reasonable to your clients). You’ll get to decide how you want to brand and market your business. All of these things can be a great change if you’ve been frustrated in the past with having little influence on these issues as an employee. Earlier we discussed the fact that as a freelancer you’ll be responsible for all aspects of the business. That can be a little intimidating, and at times overwhelming, but it also leads to great opportunities. If your current experience consists mostly of design work, you’ll be able to develop new skills that can prove to be very valuable throughout your career. A successful freelancer will have learned many things that would be valuable for future business endeavors, or for future employers if you choose to leave the world of freelancing at some point in the future. Things like communication with clients, drafting proposals and selling to clients, marketing, customer service, and even managing the finances can all be very valuable skills to have. The common assumption when it comes to freelancers is that they earn a living doing design work for clients. In most cases this is true, but there are a growing number of freelancers who are also making at least a portion of their income in other ways. Some of the options include freelance writing for design blogs, designing and selling website templates or WordPress themes, designing and selling stock graphics, writing and selling e-books on various aspects of design, running a design blog, running some other type of website in the design community, and more. There are plenty of opportunities and many freelancers have found that these types of projects help to stabilize their income and also give them something fun to work on. I would encourage anyone to at least consider the possibilities and think about what you would enjoy doing rather than just assuming that client work is the only way to make money as a self-employed designer. Many designers take freelance projects on the side while still maintaining full-time employment. This can be a great way to try out the world of freelancing and to start to build up a client base prior to taking the risk of leaving your full-time job. This is what I did several years ago, and I encourage others to take this route if possible. It reduces the risk and also helps to reduce the stress that you’re under. If you’re not starting from square one at the time you eventually leave your full-time job it will be more realistic to be able to replace your salary in a short amount of time. For many designers who want to make the jump to full-time freelancing, the most intimidating thing can be wondering where you will find clients. If you’ve worked for a design studio or as an in-house designer this is probably something that you did not have to worry about. Finding paying clients is obviously a critical part of being a freelancer designer, so we’ll take a look at how you can go about finding those first clients in the early months of your endeavor into the world of freelancing. Most of the designers that I know, myself included, got started by creating websites for family or friends. It could be your uncle that owns a restaurant, your friend that wants to start a blog, your mother-in-law that has a legal practice, etc. If you think about all of the people that you know in your circle of family and friends there are probably at least a few potential clients. Yes, there can definitely be some complications when working with friends and family, but when you’re just getting started you’ll probably need some projects to get started. The money that you make from these projects will help, but where they can be really valuable to you is in the experience that you will gain from managing the projects, the work samples that you will get for your portfolio, and the referral possibilities that it will open up. Even if your friends and family do not have a need for your services, they will know other people that you don’t know, and maybe they can introduce you to someone else who does need your services. This is a great way to start to get things rolling. Talk to all of your friends and family to let them know what that you are freelancing and the types of services you offer, and ask them if they know of anyone who might be in need of your services. Be proactive and ask for referrals, don’t assume that people will think to send referrals without being prompted. Just about anyone who is going to hire you for a project will want to see some samples of your work. A good portfolio site can serve as a salesperson for your services. Don’t rush the process of creating your portfolio site. Make sure you take the time to create a site that represents your best work and what you can offer to clients. An effective portfolio site can be a priceless asset for a freelancer. When you are just getting started you will probably need to convert a high percentage of the leads that you get. You might not have the luxury of having a lot of other potential clients to fall back on, so you’ll want a portfolio that will help you to land the projects of those who are considering hiring you. Closing a sale and securing work from a potential client is usually a big challenge for new freelancers. It’s a skill that most of us have to work on, and it’s not easy for most designers. But if you can become effective at communicating with potential clients, understanding what they want to get out of the project, and clearly communicating how you can solve their problems, you can wind up closing a high percentage of these deals. Part of the process involves providing the client with a quote or estimate along with your proposal. Preparing these proposals is probably not the most enjoyable part of being a freelance designer, but it is a critical part of the job. By presenting a clear proposal with a professional appearance you will be a step ahead of many other designers. There are several different ways you can go about providing a professional-looking proposal to your clients. You can use a pre-designed template like the ones available from our shop that will make it easy to present a proposal that looks great. 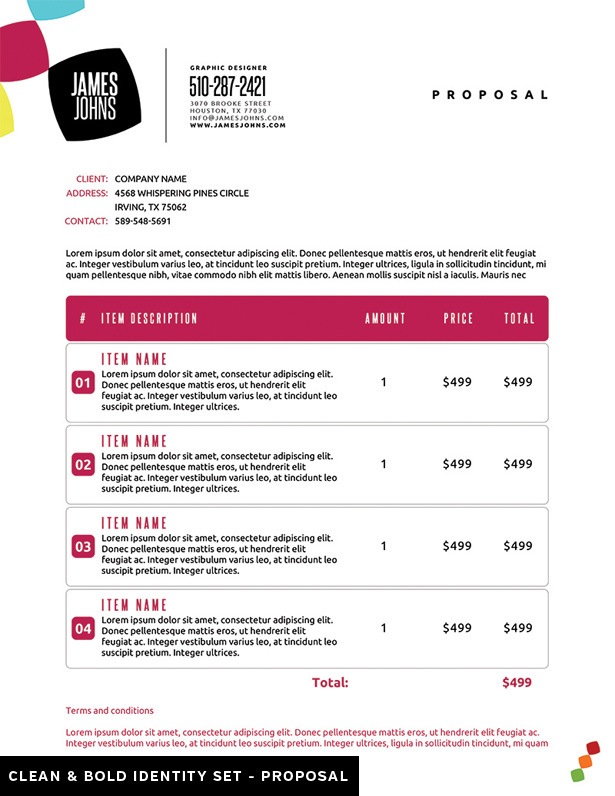 With the identity sets that are available you can get a proposal template that will match other things like a business card, invoice, brochure, and other marketing/branding templates. This helps you to present a consistent brand image to your clients. Another option is to use a web app like Bidsketch or Quote Roller. These services will help you to manage and track your proposals in addition to allowing you to create professional-looking proposals. For more information on this topic please see 5 Elements of a Persuasive Web Design Estimate. Earlier I mentioned that you should be proactive with asking friends and family for referrals. As you start to get clients you should also be asking these clients if they can refer you to others that may be able to use your services. Happy clients can be a great source of new leads, and you’ll probably find that you’re able to convert many of these leads into sales since they have been referred to you by someone that they trust. In some cases you may want to go beyond simply asking for referrals. One option would be to offer some sort of referral incentive. If you’re dealing with referrals from clients you might consider offering a discount on your fee if the client refers you to others who wind up becoming paid clients. If you’re doing on-going work for the client you could offer a discount, such as a free month of hosting if you are hosting the client’s site. Offering some type of incentive can often lead to more referrals as people will likely put a little more effort into thinking about who they might know that could benefit from your services. In addition to reaching out to your friends and family, also stop to think about connections and affiliations that you have. Perhaps the gym that you go to every day could use a new website or a re-design. Maybe the coffee shop that you stop at in the morning could benefit from a flyer design for an upcoming promotion. Maybe you volunteer at a local charity that badly needs a fresh look for their website. Maybe your kids are involved in some type of community group or team that needs a new logo. All of these would be possible clients, and if you have some sort of connection or affiliation they may be more likely to hire you than some other designer. When you stop to think about all the people and businesses that you are in contact with on a daily, weekly, or monthly basis you can probably come up with several that might be able to benefit from your services. You might be surprised at how many designers I’ve talked to over the years that got started by finding clients at Craigslist. It may or may not work for you, but it only takes a few minutes to create a classified ad at Craigslist to promote your services in your local area. You’re not likely to find huge projects with this approach, it will most likely be projects with smaller budgets, but it can produce some work. And anything that takes very little of your time and money and can possibly produce business is something that you should not ignore when you’re just getting started. If you’re having trouble finding clients from your friends and family and from your other connections and affiliations, you may need to take a more proactive and more aggressive approach. Wherever you live, chances are there are plenty of local businesses that have a strong need for your services. They may or may not be actively looking for a designer, but most of them know that it is something that should address and would be a good investment for their business. Cold calling is not something that any designer wants to do, but in some cases it can be quite effective. You can do it either by phone, in person, by mail, or by email. However you do it, be professional and get to the point quickly. Tell them the services that you offer and provide some work samples. Rather than just showing them a sample of a pretty design that you created, if possible, give them some specific details about how your work has helped your other clients. If one of your clients was another local business that saw a 10% increase in revenue after you re-designed their website, mention that. Give them an idea of how your services can help their bottom line and they’ll be much more inclined to consider hiring you. If you’re not sure where to start, a local chamber of commerce can be a good option. Most chambers will have a member directory, either on the chamber website or in print form that you can pick up at the chamber offices. There are also frequent networking events at most chambers, so you can take a few hours and get to meet many other business owners in your community. This is a great way to start to market your services in your local area and to build up your own network. Of course, most freelancers would prefer to land clients without having to pay for advertising, but this is always an option if your other efforts aren’t successful at bringing in clients. With pay-per-click advertising, like Google AdWords, you can get visitors to your website at a low cost per click, depending on the keywords that you target and the amount that you bid. You can also target a specific geographic area so your ads will only be shown in your local area if you prefer, which is a great way to keep your costs down. You can also start and pause the campaign whenever you want, so if you suddenly get busy you can pause the ad so you’re not paying for it when you don’t really need it. I would recommend creating a landing page to send these visitors rather than just sending them to the homepage of your portfolio site. You might want to have a landing page that offers a free estimate and prompts then to enter their contact data into a form. This is a good way to encourage the visitor to take account and it’s a good way for you to start to get some leads. In addition to AdWords, Facebook ads can also be quite cost effective. If you find that you’re spending all of your time trying to find new clients and you’re not having much success, consider spending some of your time on a personal project rather than dedicating all of your time to looking for clients. The personal project could allow you the opportunity to do something that will bring in some money, and it may also wind up serving as a great project that you can add to your portfolio. We talked a little bit earlier about personal projects, but some of the possibilities are a blog, a community website of some sort, designing and selling stock graphics, designing and selling templates/themes, an e-book, etc. There are no shortage of options. The downside is that it will take some time to see the financial reward for your efforts and it may take a lot of work before that happens, but they can be a great way to supplement client work. Some possibilities, like designing stock graphics for sale, are great for freelancers because you can work on them between client projects whenever things happen to be slow, but you can also drop them whenever clients come along. If you have some words of wisdom for our readers from your own experience, please feel free to share in the comments. Or, if you have a question related to freelancing, please feel free to ask.